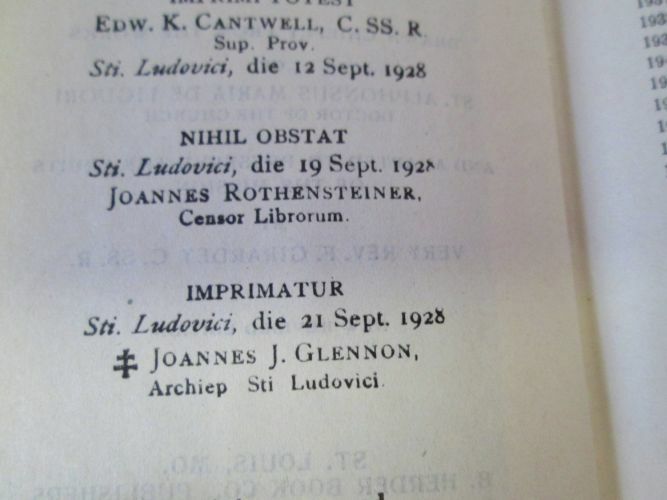 "Imprimi Potest," "Nihil Obstat," and "Imprimatur"
The procedure works like this: when a Catholic writes a book on faith, morals, theology, liturgy, books on prayer, editions of Sacred Scripture, etc., he will submit his manuscript to his diocese's Censor. If the Censor finds no problem with it, he will give it his stamp, which reads "Nihil Obstat," or "nothing stands in the way." He then sends it to the Bishop for his review. If the Bishop finds nothing objectionable, he gives the book his "Imprimatur" which means, "let it be printed." If the Catholic writing the book is a member of a religious order, the manuscript is first sent to his religious superior before it is sent to the Censor and Bishop. If the religious superior finds no impediment to publication, he will give the book his stamp of "Imprimi Potest," which means "it can be printed." The "Nihil Obstat" and "Imprimatur" are official declarations that a book or pamphlet is free of doctrinal or moral error. No implication is contained therein that those who have granted the Nihil Obstat and the Imprimatur agree with the content, opinions or statements expressed. Please know that the presence of an Imprimatur does not mean that a book is an official text of the Church. It doesn't make the book the equivalent of an encyclical, say. It's not the approval of the work by the Pope or a dogmatic Council, and it's not a stamp of infallibility. It doesn't even mean that everything in the book is accurate, only that there is nothing in it that contradicts Catholic dogma. But, while occasionally a book sneaks through and its Imprimatur later recalled, this procedure is an important way for Catholics to increase their chances of staying error-free with regard to doctrine. Sadly, because of the triumph of modernsists and liberals in the human aspect of the Church since the Second Vatican Council, books which could well contain a watered-down theology, a warped view of History, etc. now do receive the "Imprimatur." Bottom line: When buying books on religious and spiritual matters, seek out those books written before Vatican II and which have the "Imprimatur," or those books which are known to be written by solidly orthodox traditional Catholics. Otherwise, be wary and take the book with a grain of salt. And, always, if you come across a book that says horrific things about the Church, Her teachings, or Her history, read the traditional Catholic point of view and dig up objective resources. There's a lot of lying going on out there, folks. "nothing stands in the way"